Funds like ECC and OXLC that invest in equity tranches of CLOs have attracted a lot of interest from investors due to their high distribution rates. We review the CLO equity asset class within our framework of permanent capital loss and suggest a way that investors can think about potential returns. Our main point is that due to the non-linear nature of CLO equity, investors have to think hard about the level of default and recovery rates. This is because CLO equity investments can result in permanent capital loss far in excess of other assets like bonds and stock from which it may not be possible to recover. Investors should think hard about the next default cycle which may feature higher default rates and lower recoveries due to high corporate leverage and debt levels. CLO equity funds like ECC and OXLC have attracted a lot of attention from income investors due to their high distribution rates. In this article discuss the underlying asset class - CLO equity - with two goals in mind. First, we discuss the asset class within our framework of permanent capital loss which we find helpful in comparing risk and reward of various asset classes. And secondly, we come up with a simple scenario matrix as a way to think about potential returns of CLO equity given various default scenarios. Our main point is that the non-linear nature of CLO equity sharply increases the risk of permanent capital loss from which it is not possible to recover, unlike in linear investments like portfolios of bonds and stocks. Our second point is that given sizable risk of loss, investors have to think hard about the level of default and recovery rates in the medium term, given that a buy-and-hold approach is simply not suitable for this asset class. We find it difficult to recommend anything beyond trivial allocations to CLO equity funds ECC and OXLC for several reasons. On the macro side, the level of corporate leverage, looser underwriting standards and sizable level of corporate debt in absolute and relative-to-GDP terms makes us relatively cautious on the broader asset class. On the fund side, the large management fees, the additional leverage embedded in the structure and the low level of portfolio arbitrage spread available to equity tranches makes these investments doubly unappealing for the time being. One idea we harp on is the concept of permanent capital loss which often gets lost amid the scramble for yield and discounts in the fund space. Our key mantra is that different asset classes and sectors have different dynamics of potential permanent capital loss. Within the corporate debt asset class such as investment-grade, high-yield bonds and loans, permanent capital loss comes from defaults (for all three asset classes), fallen angel migrations into junk (for investment-grade, particularly if funds are forced to sell due to rating mandate constraints) and refinancings (in loans when the loan gets refinanced at a lower credit spread). The larger and more unpredictable of these is defaults so let's have a closer look at it. The chart below shows annual corporate debt loss rates. We can see that total annual losses have ranged from low to high-single digits per year. 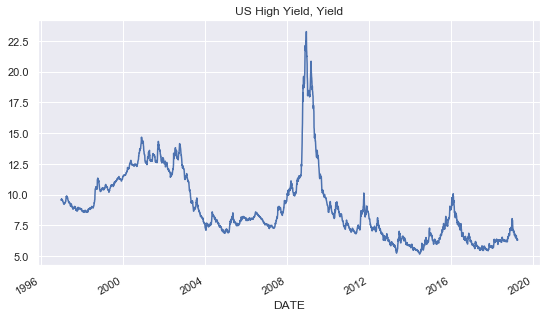 With yields on loans and high yield bonds ranging from mid to high single digits, we can see that, historically, you didn't have to wait very long to get whole - even a year of steep losses of near 8% in 2001 would have made you whole on interest from the rest of the portfolio within a year or so even if you were so unlucky as to have bought corporate debt during the relatively low-yielding period prior to 2000 when it yielded around 8% or so. In equities, you have a similar dynamic where, assuming you are reasonably diversified, the stock portfolio could very well bounce back to previous highs. 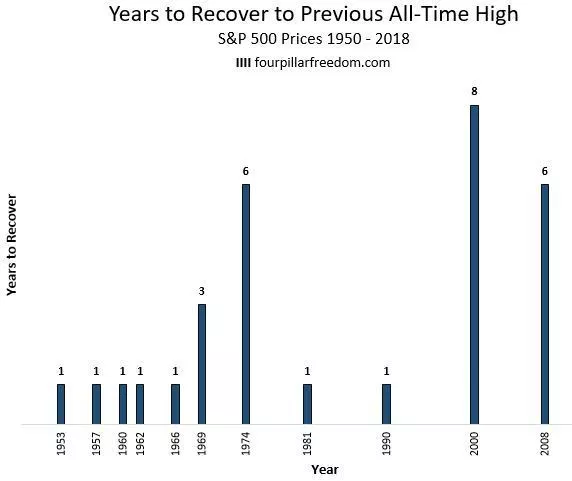 Below is a chart of how many years it has taken the S&P 500 to recover from previous lows. Yes, 8 years is a long time to wait from 2000 but that was the worst case scenario to get whole in the last 70 years which is frankly not too bad. So, to summarize, permanent capital loss does occur in asset classes like corporate debt and equities and it can be painful. However because the rest of the portfolio is alive and keeps performing, you end up clawing back to whole in a reasonable time frame. In corporate debt it has taken a couple of years and in equities it has ranged from 1 to 8 years. This is a crucial point - there has to be a part of the portfolio remaining in order to earn back the capital that was lost. Which brings us to CLO equity. The crucial bit about CLO equity is that the portfolio that you have exposure to is not the 100% of the loan portfolio but roughly the 10% of first losses. This means that if the portfolio suffers 10% of losses, you don't have any more positions remaining to get back to whole. It's game over. You have lost your entire principal and you will never get it back. You will never get it back because you no longer own any income-generating assets. Granted, you do get paid quite a bit more to hold CLO equity - on the order of 2x more (yields on OXLC and ECC are around 14-17%) vs (6-9% in high yield and loan CEFs) and if you are not reinvesting interest and corporate debt losses do not exceed a certain level you could do very well. In a way, CLO equity is a riskier position to hold than stocks because at least with a diversified stock portfolio some companies could go bankrupt, other companies could be disrupted and suffer reduced earnings and some others could suffer permanent multiple reduction. But by-and-large the rest of the portfolio should keep churning out regular earnings and as broad-market multiples wax and wane you should get back to whole as history has shown because the entire corporate sector, as a rule, does not go bankrupt. However, because CLO equity investments do not have exposure to a broad portfolio but to the first X% of losses in that portfolio, the view that you can just wait and get back to whole no longer applies. When we discuss various funds and sectors, the response we often hear back is 'I don't care - I'm buy-and-hold'. While this attitude is not unreasonable with respect to linear assets like portfolios of bonds and stocks, it is not appropriate for non-linear assets like CLO equity. This is because there are far-from-crazy scenarios where the losses on the equity tranche are such that there will be simply nothing left to hold on to. So in our view, a buy-and-hold approach does not apply to CLO equity investments. To flesh this out somewhat, consider that for a typical 0-10% CLO equity tranche, a 2% loss rate on the portfolio in any given year (let's say because of a 4% default rate x 50% recovery) reduces your principal by 20% (= 2% / 10%) and your distributions also by 20%. It only takes 2 years of 2% annual loss rates for the distribution on CLO equity to go from 15% to 9% and that's on top of a 40% principal loss. We describe this dynamic a bit more in the section below. The reason it can be hard to get one's head around CLO equity funds is that these funds are fundamentally different from the more staid corporate debt sector funds because of the additional leverage embedded in the CLO structure. To illustrate the difference, imagine a 100 loan, equally-sized portfolio. A default by one name in the portfolio with no recovery results in a 1% permanent loss of capital for a fund that is just long the portfolio. The same default is magnified around 10x for a CLO equity position resulting in a 10% permanent loss of capital. This is because the CLO equity position takes exposure to roughly the first 10% of losses in the portfolio, meaning a 10% loss in the portfolio entire wipes out the CLO equity position. What we try to do in this section is to come up with a reasonable way to approximate returns given various default-rate and recovery-rate scenarios on a 5-year investment in CLO equity so investors can plug in their own estimates or probabilities for various scenarios to gauge whether a CLO equity investment makes sense for them. We make a lot of simplifying assumptions, so we want to be clear that the approach we take with our scenario matrix is just an approximation of what happens in the real world. Of course, every fund is different in their portfolio composition and the decisions its management will take, but as a first stab at gaining an intuition around the asset class, we think it's a reasonable start. Equity tranche attachment points - 0 and 10% (these are the losses that the equity tranche bears first). Annual default rate is shown on left side of the matrix ranging from 0% to 10% annual rate. Recovery rate is shown on the top of the matrix ranging from 90% to 50%. The time horizon of the investment is 5 years with identical annual default rate and recovery rate. We assume a 14% distribution rate on the fund and no reinvestment of distributions on a 5-year time horizon. The numbers in the table are total unannualized returns e.g. given a 4% annual default rate with a 70% recovery rate, the total return on the long position over 5 years is -15.2%. This means that a $100 initial investment is left with $85 at the end of 5 years counting all distributions. Total interest earned is 44.80% which is the annual 14% on the remaining notional on the equity tranche after each year. For example, in the first year, total portfolio loss is 4% x (1-70%) = 1.2%. For the equity tranche that equates to total principal loss of 12% (=1.2% / 10%). The interest earned in the first year therefore is 14% x (1-12%) = 12.3%. Total cumulative principal loss over 5 years is 6% (=5 x 4% x (1-70%)). For the equity tranche that equates to 60% (=6% / 10%) of principal. To get a perspective on the scenarios in the matrix above, we include some historic data on both default rates and commentary around recovery rates below. Very broadly, the key difference between the last default cycle and the next potential default cycle is the fact that the previous default cycle was characterized by the leveraging of the consumer balance sheet. Since the financial crisis, consumers have deleveraged sharply, while corporates have re-leveraged taking advantage of low interest rates and the search for yield. This suggests that the next crisis is more likely to center around weakened corporate balance sheets. We include a comment from Moody's below on potential recovery rates in the next default cycle. Overwhelming demand for floating-rate leveraged loans has eroded credit quality and will lead to more defaults and lower recovery rates in an economic downturn, according to ratings agency Moody's. Average first-lien term loan recoveries are expected to tumble to 61 percent from an average of 77 percent historically and average recoveries for second-lien loans will fall to 14 percent from 43 percent historically, bringing heavier losses for investors, according to Moody's. "The result is more defaults than the last downturn as well as lower recoveries, undercutting a foundational premise for investing in loans," said Christina Padgett, a senior vice president at Moody's. We would be remiss not to mention the positive side of the ledger which could help to support returns of CLO equity positions in the coming years. First, CLO managers have ways to manage risk of the loan portfolio - they will often trade out of the loan prior to default (although this does not avoid partial capital losses). CLO funds also have ways to manage their risk by upsizing and downsizing their exposure to individual CLO equity positions as well as by doing NAV-accretive things like ATM offers. Finally, the CLO structure (CLO 2.0 and CLO 3.0) is now more robust than the original structure that prevailed during the financial crisis. Also, loan default rates are expected to remain relatively low over at least the next year due to strong earnings and decent macro activity which will maximize distributions to equity tranches over this period and support returns. Our main conclusion in this article is to show how CLO equity investments are fundamentally different from other corporate debt investments due to their highly non-linear and asymmetric loss profiles as well as the potential for permanent capital loss which can leave an investor with no income-generating assets to recover the loss. Furthermore, the state of the corporate leverage cycle and the additional cost and risk of CLO equity fund wrappers make it difficult for us to recommend anything beyond a trivial allocation to these funds at this stage. Check out Systematic Income and get immediate access to the charts and data used in our articles for hundreds of income CEFs.